Graphic via Erin O'Brien who found this amazing Flickr gallery with pages and pages of vintage cards. Not doing anything for Halloween myself this year. Haven't carved a pumpkin in years but always enjoy seeing other people's work. Love these amazing space-o-lanterns. And not to be missed on any year are my friends Rich and Flo's annual pumpkin art. If you've never been there, click on all the links at the bottom. The archives are full of great ideas if you're still carving. 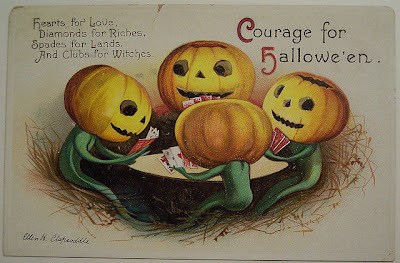 And of course, no Halloween is complete without witches. Who in real life are beautiful and cast spells for good things, like my friends Maeve and Hecate. If you're going out to celebrate, be careful out there. I hear the Zombies are really bad drivers. I'm home at last. Really tired out from the drive. First two days were easy. Pleasant even. Took a new route I'd never been on. Light traffic. Interesting scenery. And early stops because a headlight went out so I stopped at sunset. Yes, I know I could have had some strange mechanic just replace the bulb, but I'm paranoid about being ripped off by strangers because I'm so clueless about cars. I only trust my local guys here to take care of my automotive needs. Besides I'd rather keep the money in town. With the unemployment rate around here, the local economy really needs it. Anyway, last leg was short, just under five hours, but brutal. Intense, erratic traffic the whole way. Couldn't use the cruise control. Lots of nerve wracking speeding required to safely stay in the flow of traffic. And too much sudden braking when somebody actually takes the speed limit signs seriously and is going less than 10 miles over the limit. Or worse yet, the actual speed limit. It's going to be a crashing out day for me. Which the weather calls for anyway. Rainy and ridiculously cold for a place they call "the south." Probably won't get out of my pajamas so here's a video that just surfaced in my social media timeline that's appropriate for the season. Love these old Disney toons from the early days when they were still really edgy. I swear, I remember watching this as a kid. [If you can't see the embed, direct link here. Mark Herschler isn't my brother by blood, but our connection is as strong as blood family. We even look enough alike that for years many people thought we were blood relatives. Mark is one of the most versatile and under-celebrated musicians in the country, playing in a multitude of styles. One of my favorite genres is his flamenco pieces. The video sadly doesn't really do his talent justice, but good music for a Sunday nonetheless. Mark Herschler from Heather Goff on Vimeo. More videos here. And more audio clips of his original songwriting at his website. Enjoy. Shopping gods smiled on me today. Scored an $88 blue plaid summer dress for $6. Didn't even bother to try it on till just now. Fits perfectly. Looks great on me. Love when that happens. Picked up a few other good bargains too, but that was the best one. I keep trying to get to a regular schedule on this blog, but life keeps interfering. Had a couple of days off but spent the whole time on errands and phone calls. And of course, my annual seasonal affective disorder doesn't help. I hate when it gets dark. These first few weeks make me want to just sleep all the time. Not to mention, driving has been especially challenging lately. Hate driving in rain. Hate driving in the dark. Yesterday drove 300 miles in rain, which started with a torrential thunderstorm, complete with hail. And then the last 90 or so miles were in the dark and it rained the whole time. But the traffic wasn't too horrible so I pressed on. I only get off the road early if all three factors are in play. I've avoided chain restaurants most of my life but since I've been hanging out with John, we go to a lot of them. And when you're on the road they're often the most convenient and a safe choice. I mean, you been to one, to been to them all and you know what to expect. So I ordered my dinner from Cracker Barrel tonight, since it was right next door and I could walk to it. Got the Cajun Catfish sandwich platter. Great meal for only eight bucks, including the tax. Lots of food and well prepared and included good cole slaw, for the win. Trying to get on with my life, because I know Dad wouldn't want to wallow in self pity. But the weirdest things still set me off. Almost broke down sobbing at the gas stop when I saw a jar of Trucker's pickles. Would have been the perfect gift for my Dad, if he was still alive. But doing better I guess. When I'm driving, instead of listening to the radio, I talk to Dad about the scenery and the traffic. Strange, I know, but somehow it helps. Working my way through the grief cycle. I knew it was trouble when the caller ID showed the folks' phone number so early in the morning. I thought, oh no. Dad fell and broke a hip this time. Of course, the news was much worse and completely unexpected. First you scream -- No! It can't be true. It's a terrible mistake. Then you deal with the immediate aftermath. The arrival of the nearby family members. The hugs. The tears. Softly murmured recollections of good times. The sound of heart wrenching sobs from a behind a closed door. Sometimes they're your own. The funeral home. The insensitive funeral director trying to talk Mom into a more expensive option than they had already paid for long ago. Gratefully, Dad made his preferences clear. A speedy cremation. No public viewing. A private strewing of the ashes. Oddly the most comforting moment was when we got home again. The very religious neighbor came over to ask if it would be okay to mow the lawn. Then he asked if he could say a prayer. He prayed for us. The heathen survivors. To find peace. Somehow it helped.